Before diving into each strategy, it’s important to keep in mind that pricing is primarily a science that must take into account several market factors and drivers. Some of these include: segmentation of the target market, price sensitivity, consumer behavior and psychology, distribution channels and tiered systems, overall economy, competition, substitutes, industry standards, value-added features, brand positioning objectives, portfolio management, revenue models, costs, and overall corporate goals. Pricing is directly related to the perceived value of your offering, and how it services a customer’s need. This strategy relies on charging for this perception. An example is if a company offered seemingly similar products but each containing minor feature variations appealing to distinct segments, as in the case of TV manufacturers. They make one product line with multiple variations in resolution, smart features, size, etc. to attract different consumers. Each variation has a higher perceived value to a particular segment, and can charge accordingly. This enables a company to extract greater revenues for minimal additional expenses, reach a wider audience, and strengthen a bond with each particular segment. Another example is with art. Artists charge for the value their artwork brings to the buyer rather than basing the price on costs. When using this strategy it becomes very important to quantify the value obtained by each benefit to get a better sense of the right pricing. This occurs when a company combines multiple products or services in a single price point. The bundle may also include products or services from strategic alliances with other companies, The combined products or services are typically priced less than if each was sold individually, but not always. At times a temporary bundling partnership may serve to enhance market exposure by offering the bundle at both companies’ locations while minimizing any decrease in the offering’s margin. Eg. McDonald’s food combos: A burger, fries, and drink separately cost more than when bought together. When a brand positions itself as luxury or authority it will price offerings at a premium. This type of pricing strategy targets a niche market willing to pay a premium for either the exclusivity, reputation, or the peace of mind gained by buying the authority brand. This strategy filters its consumers and extracts higher margins from the smaller potential market. Close attention must be paid to consumer insights of these markets when setting prices to understand what it is they value in order to effectively communicate it to justify the price. Eg. Aside from typical Luxury Brands, this strategy can be observed at any pharmacy. The premium charged for a brand name cough syrup versus the generic brand. This strategy is when a base product or service is offered as well as additional options that enhance the product or service. The base product has a set price, and the consumer will select the various add-ons they seek and pay for those accordingly. The “Freemium” model is a derivative of this strategy as you pay for additional features. Eg. Airline industry. They charge a base fare for your flight. If you would like to select your seat, add checked luggage, obtain a meal, you pay accordingly. This strategy requires that a company calculate the variable cost and determine a markup percentage. This percentage is considered the contribution margin (price minus variable cost). Contribution margins typically have an inverse relationship with quantity sold. Therefore, the markup chosen should be the one that allows for a maximized total profit (contribution margin x number of units sold). This pricing strategy is more mechanical and does not account for customers’ willingness to pay for value added. It is commonly referred to as cost-plus pricing. Eg. Restaurants in the fast food industry usually use this type of pricing by assigning a percent margin per item sold. A company may set low prices through promotions (discounts, coupons, bundling, etc. ), a sudden price drop, or through a low price introduction to market. This strategy may be used for a variety of reasons, such as (1) a short term objective to increase sales or grow market share, (2) penetrate a market by offering a deal to early adopters or to an initial membership base and gradually increase pricing as the customer base grows or as the company expands its offerings, (3) during seasons or cycles typical of the particular industry, and (4) the company wants to position the brand as the low-cost alternative. However, it’s important to consider the risks behind each motive. For example, low prices may lower the perceived value or quality of a brand for good, disabling the company to raise prices in the future. Eg. The most common example of a low pricing strategy is that of Walmart. They compete in the marketplace primarily on price. This requires significant volumes to be sold to compensate for low margins. This strategy is used when a company sets the price high at first and gradually decreases it over time. Initial High Pricing is generally used to take advantage of a first mover advantage where innovators, early adopters and the early majority are less sensitive to price. This group of people account for 50% of an average market. The gradual price decrease may be related to the product or service’s life cycle, the company’s roll-out phases and goals, or new entrants into the market place. Eg. New technologies like 3D Printers are priced at elevated levels when introduced and decrease throughout their life-cycle. When using this strategy, firms use the current market pricing from competitors as a benchmark. This can include the prices for substitutes or industry standard practices. The company may price either higher, the same, or lower, but close to the benchmark. Price deviations are ultimately determined by differentiators, if any, from the competitor. Eg. National Beer companies charge similar prices to the end consumer, across their entire product line. This strategy is used when a company has a two-part product or service. The initial part is given either for free, at a loss, or breakeven. The intention is to gain market share and adoption rates of a “captive audience” that needs the second part of the product for full or continued functionality. The company then makes up for the opportunity cost from the first part by charging a premium for the complementary part. This is done at different intervals and through various revenue mechanisms, which may include fees, subscriptions, and licensing. Eg. Cell Phone services use this strategy as they heavily discount the phone, but make back the cost through service contracts. As there are numeorus factors that are critical to pricing, the overall strategy should be addressed by a team that includes Marketing, Sales, and Finance. The Marketing Department’s responsibility is to perform accurate and valid market research, correctly defining the target audience, hypotheses, and mechanisms to arrive at an optimal plan. The Sales team helps validate these assumptions on the market with all involved players, tiers, and channels. They also contribute through their knowledge of the market and “on-the-field” expertise. The Finance team will determine actual variable costs. Pricing is a very complex issue and can ultimately determine the sustainability of your company. You can price yourself out of the market or you could sell below a sustainable level – both are detrimental to the life of your company. 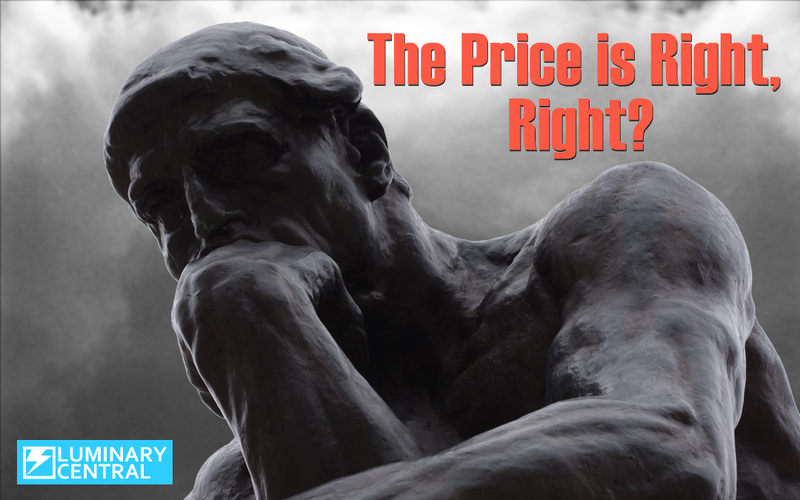 Proper analysis must be given to pricing within the overall strategy for your company. It’s unfortunate how few companies take the time to test their pricing or even be intentional about how to price within an overall strategy. I guess many don’t even have an overall strategy. I agree. Many attribute not testing prices to a limited budget for market research. What they don’t realize is there are many ways to successfully test while keeping costs very low.